For many people, the Black Isle means dolphins. 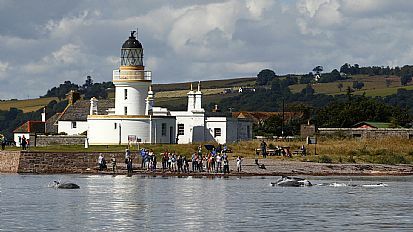 Chanonry Point is one of the best places in Europe for watching dolphins from the land: the resident pod of bottlenose dolphins often come within yards of the shore. When heading out to Chanonry Point, please consider walking or cycling the half mile out from Fortrose or Rosemarkie. There is limited parking at the Point and too much traffic spoils the peace and quiet of this lovely spot - not to say the golfers on the renowned links course of Fortrose and Rosemarkie Golf Club. Leaving the car behind reduces the pressure on the Point and cuts your carbon footprint. In season, you can hire a bike from Black Isle Bicycles at Rosemarkie Beach Cafe or Fortrose Bay Campsite, both a short, flat, beautiful bike ride from the Point. Click here for information on the pod from expert Charlie Phillips: Charlie is the Whale and Dolphin society's Adopt a Dolphin Field Officer and has studied the bottlenose dolphins of the firth for many years. You'll probably have seen some of his stunning photographs of the dolphins: get hold of his new book, "On a Rising Tide", marvel at the images and learn to recognise the individuals in the pod. If you want to help protect these wonderful creatures, consider adopting a dolphin yourself or as a gift. Check our Gallery of photos and film. There's more information about the dolphins on Moray Firth Dolphins and their Facebook page, and on the Chanonry Point Facebook page. For more information about the rich wildlife of the area, see the Black Isle Nature Facebook page. The RSPB reserves at Fairy Glen by Rosemarkie and at Udale Bay on the north of the peninsula are very different from each other, and very special. The RSPB say about Fairy Glen: Walk by a fast stream and gleaming waterfalls in this wooded glen, looking for grey wagtails, dippers and buzzards. This beautiful steep-sided valley is an oasis of calm, but do take care as paths are rugged in places. At Udale Bay, the RSPB say: From late summer to April you can see thousands of wildfowl and wading birds here. Come an hour or two either side of high tide to be rewarded with spectacular views of flocks of flying birds. In autumn up to 5,000 wigeons feed here, while if you want to see an osprey fishing in the water, late summer is the time to come. Visit Avoch and look out from the harbour for Common Terns. The Common Tern is no longer as common as it was 100 years ago: the species has been in long term decline. Predation by mink and human disturbance on the traditional nesting locations, i.e. sandy beaches, are some of the reasons for their decline. After the demise of the fish farm in Avoch Bay, the remaining rafts were made available to provide breeding platforms for the common tern, which is one of the most adaptable seabirds, able to take full advantage of suitable artificial habitat. Under careful local management by the RSPB, the colony has increased regularly and now supports up to 200 breeding pairs of terns, making it one of the most significant and productive nesting locations in Scotland. Terns can live up to 25 years or more, so a highly productive colony such as Avoch, can offset the decline in other more natural colonies.